The VISC1000 is the viscosity control system for processes with one to three stations, designed for in-line or in-tank processes such as adhesives, coatings, food ingredients, and printing inks. 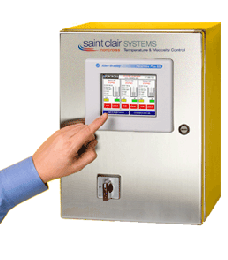 Touch-screen interface that displays parameters and trend data for each station. 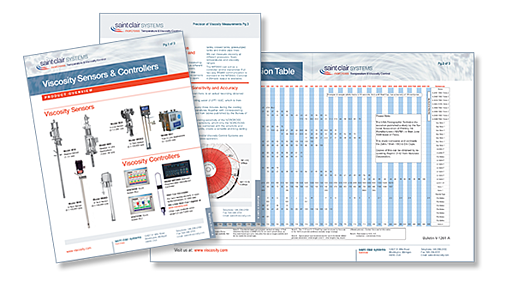 Displays set points, actual viscosity, alarms, and automatic/manual mode for each station. Provides real-time data logging and allows viscosity parameter changes on the fly. Trend plot software provides data logging from one hour up to seven days, with systems available for up to 12 stations. Allows users to change each station separately, including air valve, solvent control parameters, set points, high-low alarms, and color codes for ingredients.